Ealing Broadway. Gillingas was recorded for this area c.698 and is derived from the Saxon people the Gilla and the Old English place name word ending, ing, literally, 'the people who lived at'. It has had many changes of spelling - Ilingis c.1127, then Yealing to Ealing in 1622. The Broadway is the main road beside the station. 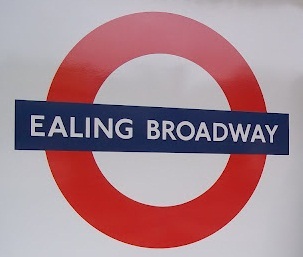 The District Line station, adjoining that of the GWR, opened as EALING BROADWAY on 1 July 1879. Central Line platforms being added on 3 August 1920. 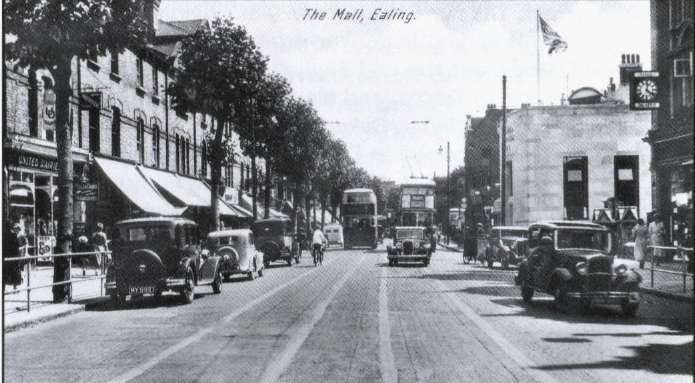 Close to Ealing Broadway station is The Mall, forming part of the Uxbridge Road, along which the trams ran between Shepherd's Bush and Uxbridge until replaced by trolleybuses in 1936. When this scene was photographed the redundant tram tracks had been covered by strips of tar prior to their removal.